Metro will hold a public hearing on a draft $4.891-billion budget fiscal year 2013-14 that begins July 1 at 1 p.m. May 15 in the Metro Board Room on the third floor of Metro headquarters at One Gateway Plaza in downtown Los Angeles. Metro HQ is adjacent to Union Station and is located on the north end of the station's Patsaouras Transit Plaza. 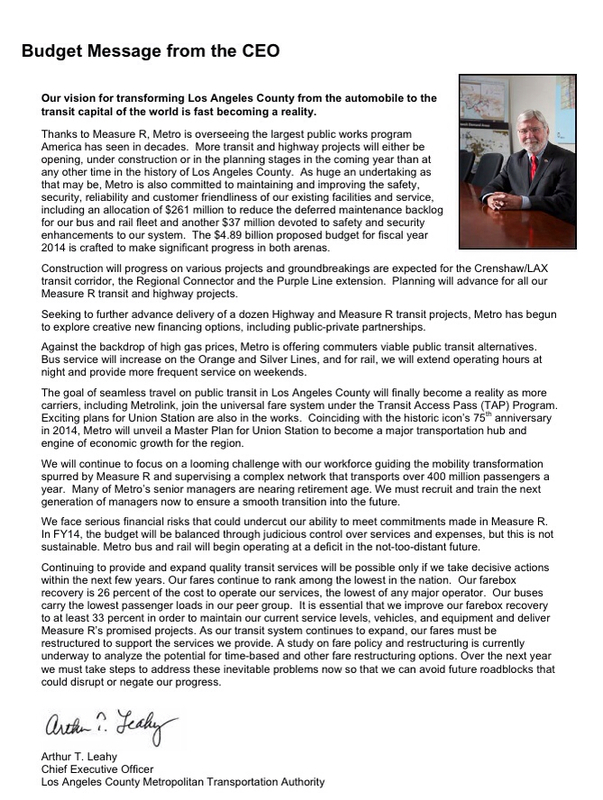 Above is a copy of Metro CEO Art Leahy's budget message. The public can view copies of the balanced budget proposal at metro.net/budget or request a copy by calling Charlene Aguayo in Metro Records Services at 213.922.2342. Metro directors will consider adopting the budget for the fiscal year beginning July 1, 2013 at the next Board Meeting on Thursday, May 23. The news release from Metro on the budget is posted after the jump. Metro CEO Art Leahy’s budget proposal calls for keeping fares at current levels, however, the CEO is urging Metro directors now to begin discussing fare restructuring for future years. He notes Metro fares are among the lowest of any major transit agency in the world, and Metro riders only pay 26 percent of what it costs to operate their buses and trains. In FY 14 more service will be added midday to relieve overcrowding on the Metro Orange Line busway in the San Fernando Valley. Additional late night service will be added on the Expo and Metro Gold Lines, and there also will be more weekend service on all Metro Rail lines. Hundreds of new buses and rail cars are on order, and construction is underway for a new state-of-the-art bus maintenance facility in downtown Los Angeles. Augmenting these efforts, Leahy is proposing to spend $261 million in the next fiscal year on deferred maintenance for bus and rail vehicles and facilities and another $37 million on capital improvements for safety and security including $20 million for gates and other safety enhancements on the Metro Blue Line. Gates in the subway and many of the light rail stations will be latched, a phased in approach that will start in mid-June just before the start of the new fiscal year. Next year Metro also plans on unveiling a master plan for Union Station that will address how the historic facility will accommodate transit system expansion. Fulfilling the voter mandate for Measure R that is greatly expanding transit options for Angelenos, in FY 14 Metro will advance design and early construction for the Purple Line Subway Extension, the Regional Connector rail line that will connect the Metro Gold, Blue and Expo lines to eliminate transfers, and the Crenshaw/LAX Transit Corridor light rail line among other transit projects and programs. Construction is well underway for the Expo light rail segment from Culver City to Santa Monica and the Metro Gold Line Foothill Extension from Pasadena to Azusa and will continue in FY 14. Taking a multi-pronged approach to easing traffic in Los Angeles County, Metro will expand its highway program in FY 14, advancing more than a dozen small and large highway projects and managing the I-10 and 110 ExpressLanes congestion pricing demonstration project. The I-405 Sepulveda Pass Improvements Project should wrap up next year. Metro also will pursue new initiatives to promote bicycling. The FY 14 draft budget is $316 million or 6.9 percent more than the current $4.575 billion Metro budget. This reflects major rail and highway planning, design and construction in the next fiscal year as mandated by Measure R. In 2008 more than 2 million Los Angeles County voters approved the Measure R half cent sales tax to advance a dozen major transit projects and 15 highway projects. In the new fiscal year Metro will be spending $1.289 billion on Measure R transit projects and $141 million on Measure R highway projects. There are risk factors for the draft budget. Metro is not immune to the state and federal budget woes that could cut transportation funding. The economy is still shaky, and collective bargaining agreements with Metro unions are being negotiated. I would like to see all of the rail lines and transit-way lines to have the additional late night service that is currently available only on Fridays and Saturdays. The current fare system has to end, but fare restructuring keeps getting punted year after year despite the expiration of the promises made to voters under Measure R. At the very least they could suspend the fare freeze, as well as the temporary Day Pass reduction, to bring fares back in line for the time being while they determine what type of structure to use.